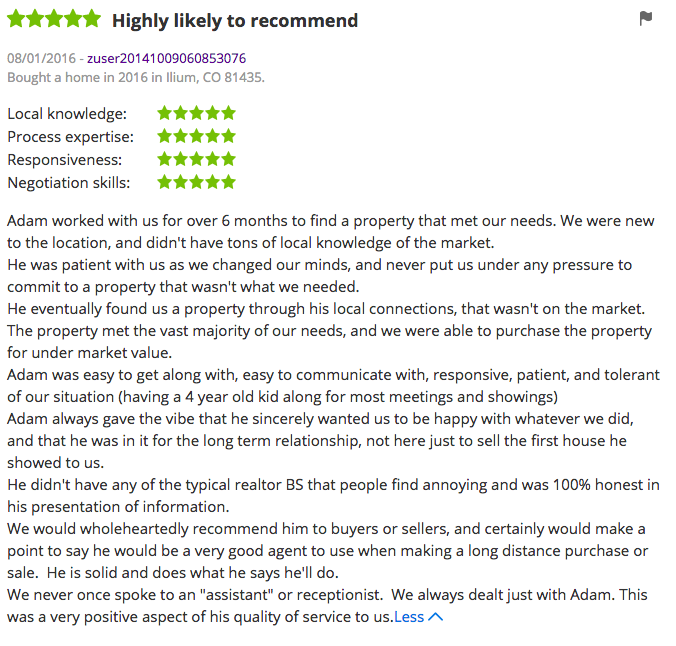 Adam worked with us for over 6 months to find a property that met our needs. We were new to the location, and didn’t have tons of local knowledge of the market. He was patient with us as we changed our minds, and never put us under any pressure to commit to a property that wasn’t what we needed. He eventually found us a property through his local connections, that wasn’t on the market. The property met the vast majority of our needs, and we were able to purchase the property for under market value. Adam was easy to get along with, easy to communicate with, responsive, patient, and tolerant of our situation (having a 4 year old kid along for most meetings and showings) Adam always gave the vibe that he sincerely wanted us to be happy with whatever we did, and that he was in it for the long term relationship, not here just to sell the first house he showed to us. He didn’t have any of the typical realtor BS that people find annoying and was 100% honest in his presentation of information. We would wholeheartedly recommend him to buyers or sellers, and certainly would make a point to say he would be a very good agent to use when making a long distance purchase or sale. He is solid and does what he says he’ll do. We never once spoke to an “assistant” or receptionist. We always dealt just with Adam. This was a very positive aspect of his quality of service to us.